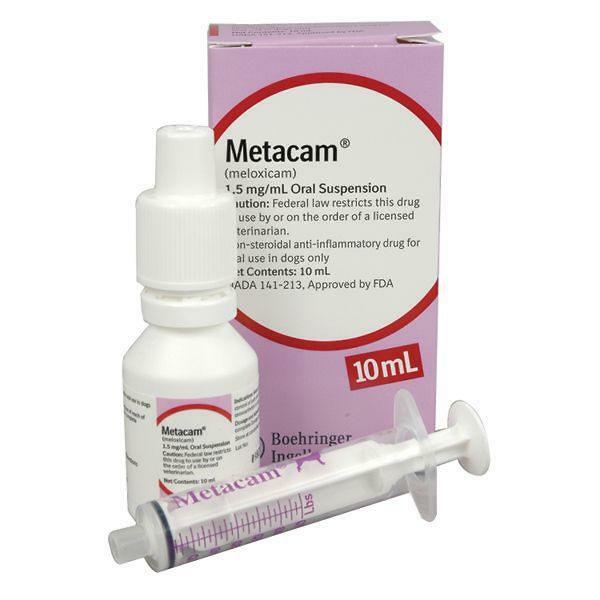 Metacam is a prescription non-steroidal anti-inflammatory drug (NSAID) that is used to control pain and inflammation (soreness) due to osteoarthritis in dogs. Osteoarthritis (OA) is a painful condition caused by “wear and tear” of cartilage and other parts of the joints that may result in the following changes or signs in your dog: Limping or lameness, decreased activity or exercise (reluctance to stand, climb stairs, jump or run, or difficulty in performing these activities), stiffness or decreased movement of joints. 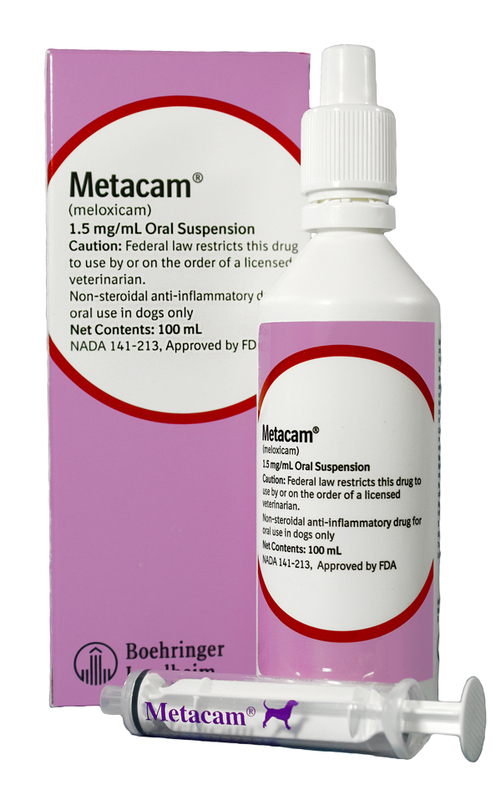 Metacam is given to dogs by mouth. 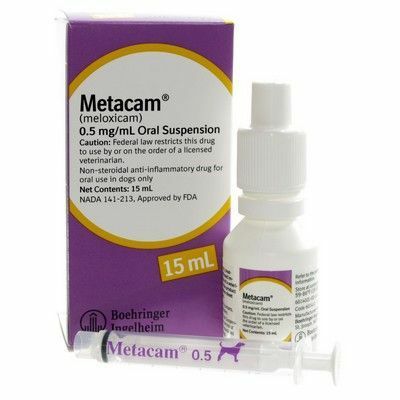 Do not use Metacam Oral Suspension in cats. Shake well before use, then remove cap. Particular care should be given with regard to the accuracy of dosing. To prevent accidental overdosing of small dogs, administer drops on food only, never directly into the mouth. Carefully measure suspension onto food to assure that the correct dose is given before presentation of the food to the dog. 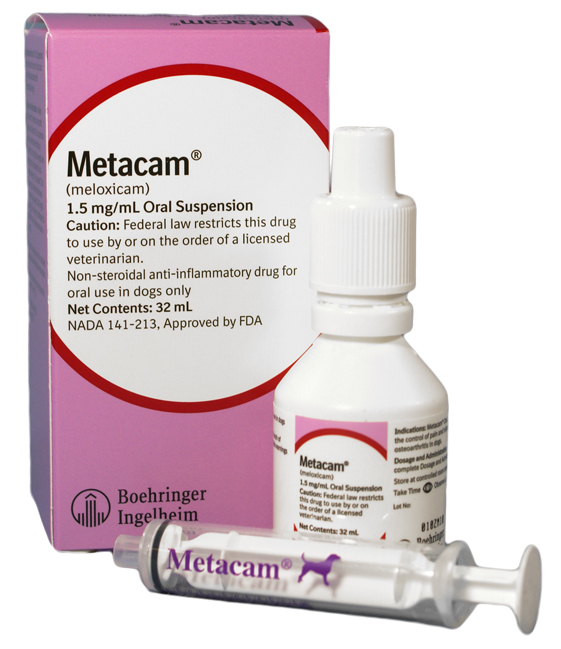 Metacam Oral Suspension can be given using the measuring syringe provided in the package (see dosing procedure below). The syringe fits on to the bottle and has a scale in pounds designed to deliver the daily maintenance dose (0.05 mg/lb or 0.1 mg/kg). When using the syringe, the dog’s weight should be rounded down to the nearest 5 pound increment. The syringe provided with the meloxicam concentration of 1.5 mg/mL cannot be used to measure doses for dogs weighing less than 5 lbs (2.3 kg). 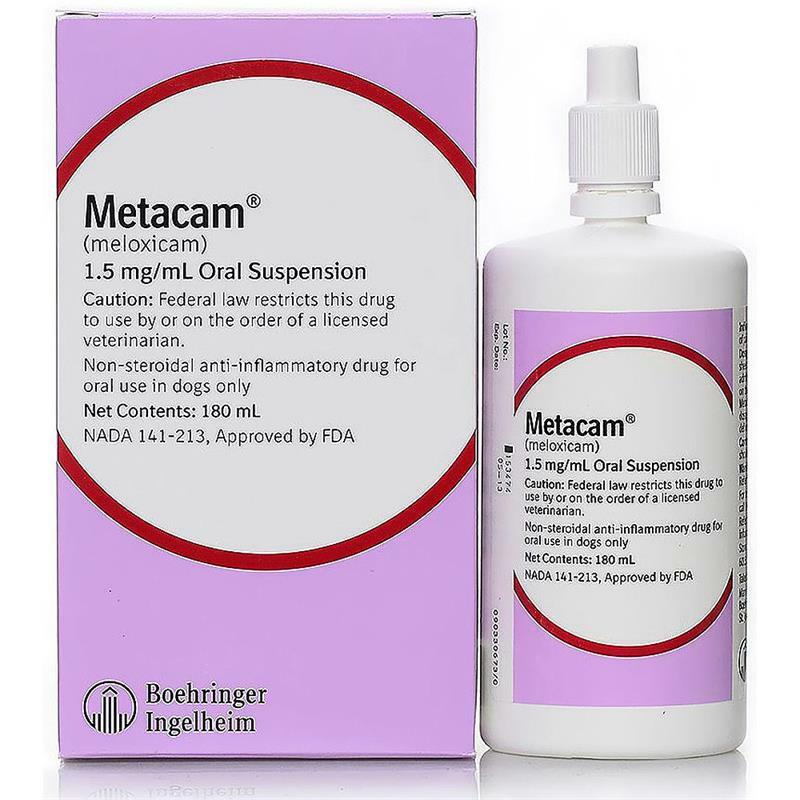 Alternatively, Metacam Oral Suspension can be given using the dropper bottle: one drop for each pound of body weight for the 1.5 mg/mL concentration (two drops for each kilogram of body weight). For dogs less than 1 lb (0.45 kg), two drops for each pound of body weight for the 0.5 mg/mL concentration (five drops for each kilogram of body weight). For dogs less than 5 lbs (2.3 kg), one drop for each pound of body weight for the 1.5 mg/mL concentration (two drops for each kilogram of body weight).